Tested: Got it on 13 April 2011, testing delayed due to circumstances, so started testing on a bike since 8 June 2011. Note, PD-7 is the current SP designation, before that it was HB015 and briefly before that 63D. Note that this hub wasn't available in the EU nor the USA under those old designations. There is a new entry in the dynamo hub arena! It's the taiwanese company sp-dynamo (or rather Shutter precision co. ltd; from that name you can deduce what field they originally came from; The advantage of coming from somewhere else is that they could look at dynamo hub design from a fresh perspective...). Their dynamos look pretty cool! They have put a lot of effort into making the hubs simpler to manufacture and efficiency should be about as good as the Schmidt hubs (perhaps about the same as the SONdelux?) but for a much lower price. There are standard versions and versions on which the dynamo part can be completely disconnected/disabled as on the Renak Enparlite to eliminate any resistance from the dynamo when it's not being used. 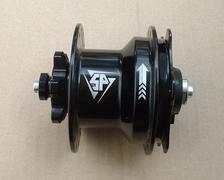 I heard SP had trouble getting interest for them under their own name (before mid 2011 at least), which is why you will be seeing these hubs in the US and Europe first under other names, and/or with a different dynamo shell but using the SP-internals (this goes for various types of the SP hubs I think). I should be getting a sample to test soon (January? middle of April)). Note about disconnecteable hubs: For the Renak this makes sense due to the noise of the gearing, for non-geared dynamo hubs this doesn't look all that useful to me, I'd say more a marketing advantage than a real advantage as the loss of 1 W or 2 W in power (I assume it's just this much) just doesn't influence your speed much. See the calculations at the end of the main bicycle lighting page for how little a few Watt changes your speed. 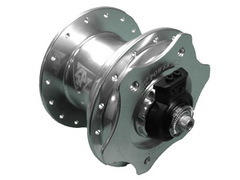 So Velo Orange may call this a game changer, it actually isn't... Well, it makes a difference but the difference is only important for those who race and want every bit of advantage they can get. I will add some example calculations (of lost distance/time in a long race) later. I will also add the results of a test to measure the time you loose by switching: When riding at say 30 km/h, then stopping the bike, switching the dynamo from on to off or vice versa, then getting going again and speeding up to 30 km/h. This is of course to see if the time you lose by switching the dynamo off/on in a race is worth it in more time gained during the race. 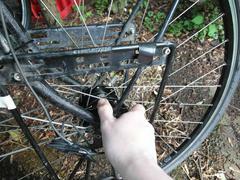 User serviceable: No, unless you make your own tools (and worse, the axle ends are round since I think 2013... I will see how to deal with that). If the bearings wear out after the warranty, that can be done for a cost of $30, there is a service centre in Germany (possibly others, I will see). 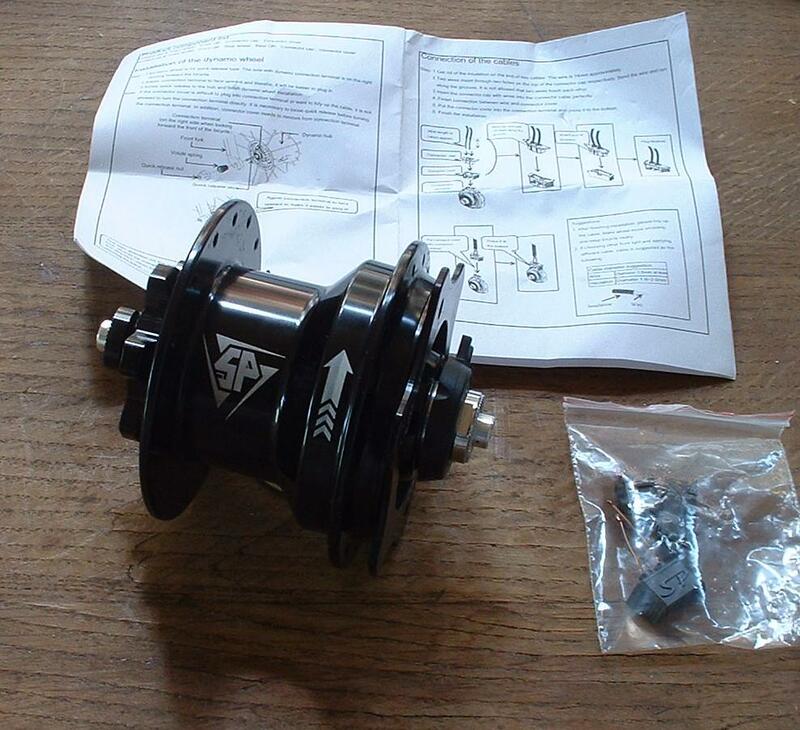 If after reading this review you're interested in a SP dynamo hub: see here. When spoking in the wheel with the PD-7 I needed to rotate the clutch thingy a few times from on to off and reverse to get all the spokes through. This was a bit annoying. 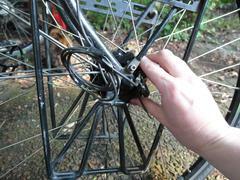 The flanges are equidistant from the hub ends which makes spoking it in very easy and quick. In use: I couldn't really feel any vibrations from the dynamo hub, but the rear wheel vibrated a little which could have masked it. I fixed the rear hub and tested this time with a Shimano DH-3N80. Vibrations could be felt in the handlebar and also the saddle (how much you feel it in the saddle depends on how tight the headset is). I switched the front wheel back again to one with the PD-7. Well, the vibrations are very hard to feel. I went to another road with very good/smooth asphalt to see what I could feel and still it was very hard to feel precisely the vibrations and at which speed they start/end. It seems SP has done a good job in reducing vibrations. I wonder how they achieved this. I suppose it has to do with amount of steel used (around which the coils are wound) and the way the core is fixed together. The next day another 20 km most of which was on good asphalt, and still I couldn't really be certain about any vibrations. Perhaps masked by the not 100% perfect rear wheel but in any event, the vibrations are far less than with the DH-3N80 with which I could easily feel vibrations. 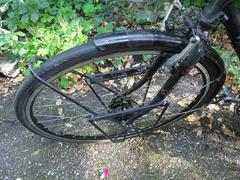 I will test more with the PD-7 in another bike and with a different rear wheel. 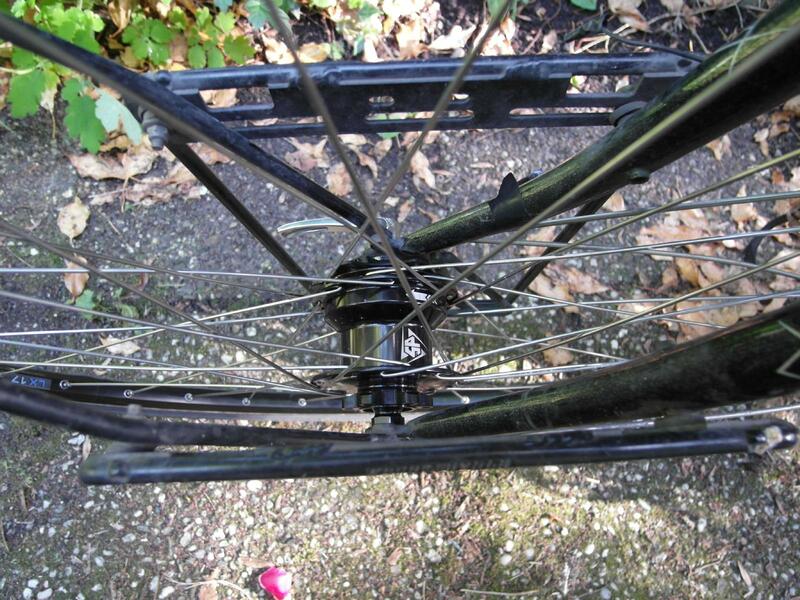 30-7-2011: More testing done with another rear wheel and it became very clear now: It's hard to feel the vibrations, especially because there is not a strong start of them as with other dynamo hubs. So the vibrations may get stronger at around 19-22 km/h as with various other hubs, but I'm not sure about that and there is no real start of vibrations that I feel. This may be due to the vibrations being weak, and/or due to vibrations starting earlier and if they increase, then it's very steadily. I could feel for sure the difference between light on and off only when I rode and switched the Edelux on and off while riding. In that case I felt a slight vibration suddenly starting when I switched the Edelux on. 2011-8-15: More rides using a butterfly bar and flat bar with different grips show that the handlebar makes a noticeable difference. In any event, in the worst case (flat handlebar with hard grips) the vibrations are not annoying, the start of the vibrations is almost impossible to feel, the end of vibrations is at about 26 km/h on the test bike, just a bit less than the SP PD-8. 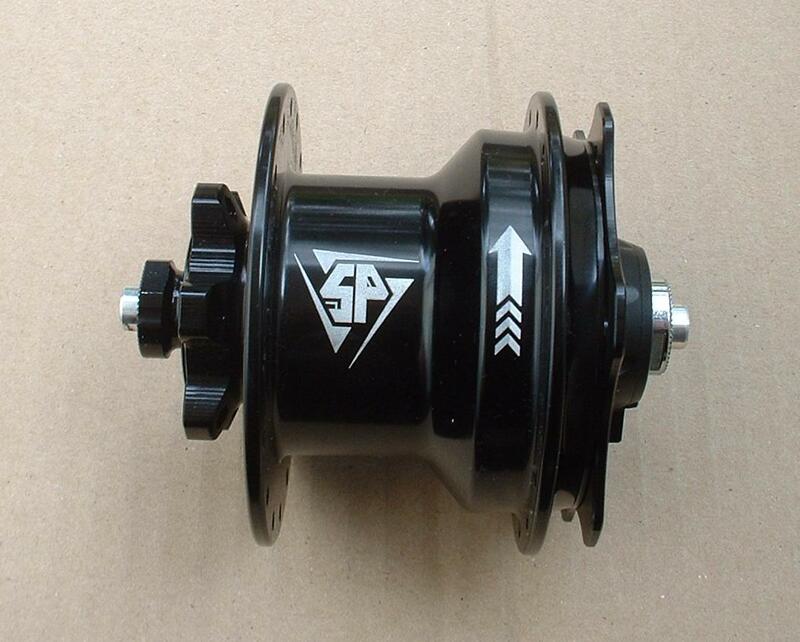 This means the PD-7 is still my favourite dynamo hub after testing the SP series 8: PD-8. 1. They are well aware of it and had initially set a product design objective of reducing or eliminating it. 2.2 The type of lamp used. 2.3 They also had a result that we didn't consider, which is that the weight of the rider is important (which is possibly connected to the rigidity of the frame, but I'd say especially the rigidity of the fork). So, they had a number of different factors of varying impact, but due to the complexity they decided not to put a great deal of effort on the objective of reducing vibrations later on in the design process. But as my experience has shown, despite not putting in a lot of effort into this aspect of the design, they seem to have succeeded very well. Btw. after my testride where I found no vibrations, I asked that friend about his experiences with the SP, and they are the same as with me... (Using the same bike, with either Shimano or an SP PD-7, with the Shimano he felt the vibrations, with the SP not). In the off mode the hub's axle can be rotated by hand very smoothly and easily. You can still feel that the hub is a dynamo hub, i.e. you can make out the steady positions from the magnets... (which seems to indicate that the lever moves the magnets and core away from each other, so not a real clutch as with the Renak Enparlite). The dynamo axle is from aluminium. 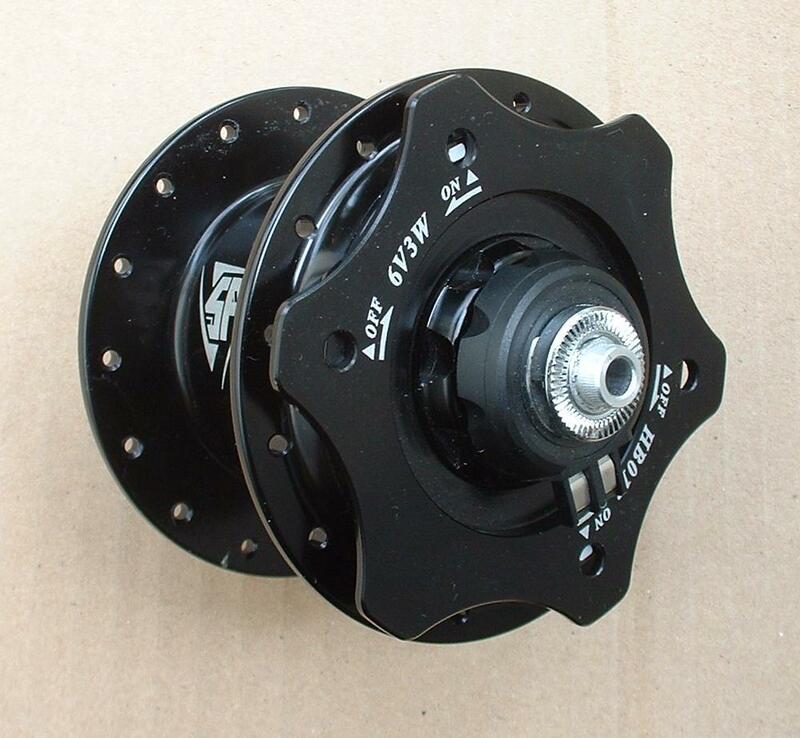 Some people have broken the aluminium axle in the Shimano DH-3N80 and for heavy use the DH-S501/DN-3N72 is recommended instead, so I'm not sure if the weight savings are worth it. 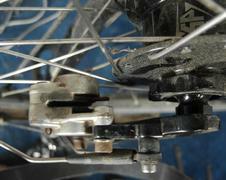 The connector is similar to Shimano's connector, i.e. in 2 parts with the wires clamped in. This is better than the Sanyo connector. The problem occurred in only one run of the switchables produced for VO. The problem was insufficient training of assemblers which was immediately addressed and rectified. 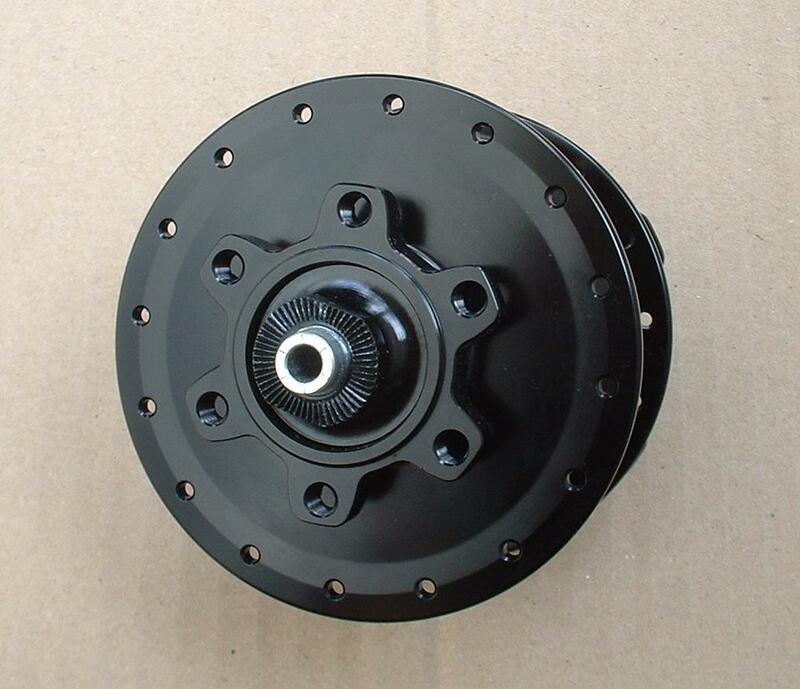 There was never any problem with the design or quality of the parts, only the manufacturing procedure. This is unlikely (if ever) to happen again.. Regarding my PD-7 test hub I can tell you that it never slips, even when powering 3 XM-L LEDs at about 8W (power to the LEDs). The clutch is also fairly heavy going; I can't see this slipping (getting loose) at all. Note (2015): I received a complaint about the switch being heavy going, and this is only an issue if you try rotating the switch on a loose hub, as you would do with a cap on a jar. When the dynamo is built into a wheel, you keep your arm at right angle to the axis of the hub, and with thumb and pointing finger you rotate the switch with pull/push which will not be a problem. Until the PDX-8x I liked this dynamo hub more than any other I tried simply because of the near absence of vibrations. 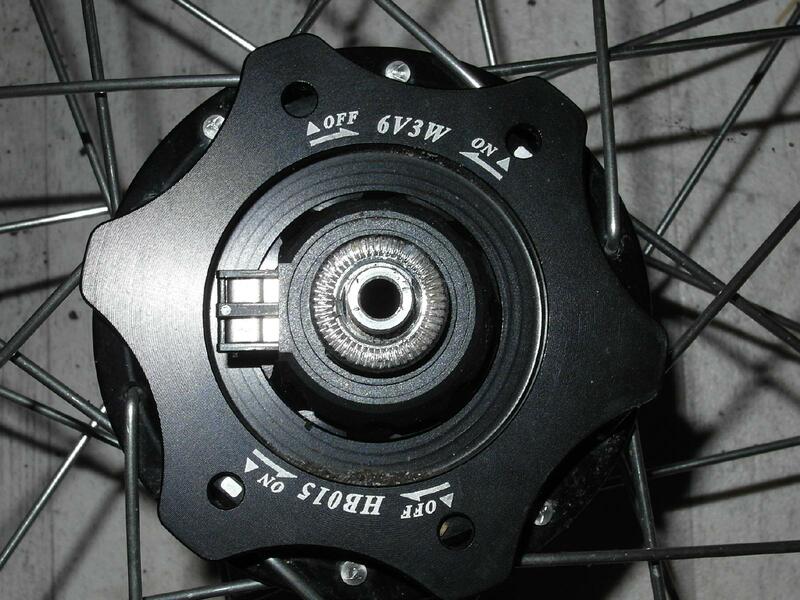 I also like that this hub is left/right symmetrical in flange position (distance to hub ends) and diameter, which made it very easy to build the wheel. And finally: It's good the dynamo part of the hub isn't electrically connected to the hub end/axle which means short circuits are less likely to happen. 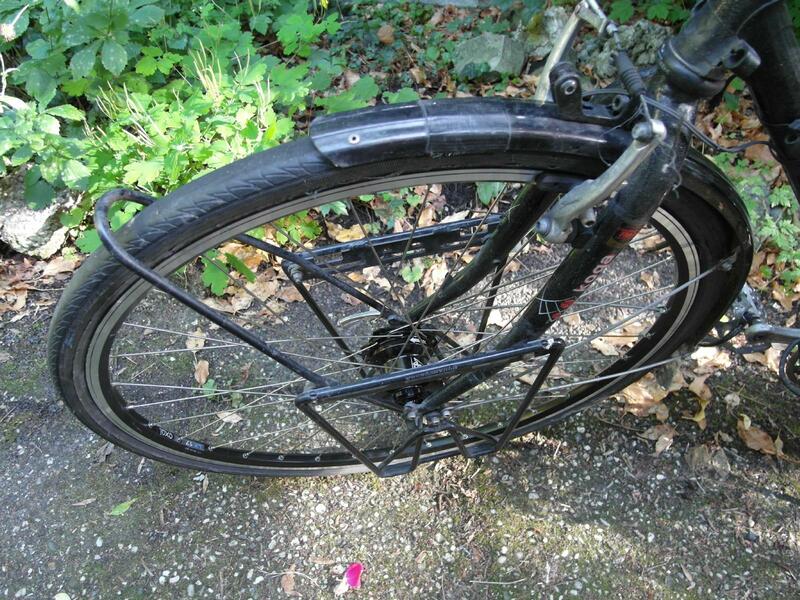 To do: High speed testing at 40-50 km/h to see what happens with vibrations (the Shimano dynamo hubs have a very strong high speed vibration which is bad, so I hope the SP doesn't have that).